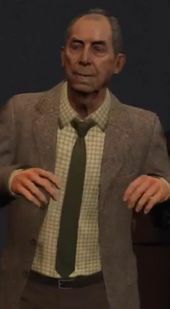 Nigel is a character in the HD Universe who appears as a Strangers and Freaks character in Grand Theft Auto V. He is voiced by Richard Easton. Nigel and his friend Mrs. Thornhill, both initially from London in the United Kingdom, are tourists in Los Santos. They have presumably been in Los Santos for a lengthy period of time as Nigel states that Mrs. Thornhill had rarely seen her family since arriving in Los Santos. Nigel and Mrs. Thornhill, who are obsessed with Vinewood celebrities, mistake Trevor Philips for Jock Cranley while going through some garbage hoping to find a celebrity owned item for Thornhill's collection. They are known to have stalked Al Di Napoli in the past as he had taken out a restraining order against them. After nearly being choked by Trevor, asking him to recreate a scene from one of Jock Cranley's films, they ask Trevor to steal various celebrity owned items. Trevor then assaults Willie and steals his gold tooth at Tequi-La-La, steals the dog collar from Kerry McIntosh's dog, steal Tyler Dixon's clothes and steals Mark Fostenburg's golf club. Trevor delivers the stolen items to Mrs. Thornhill and Nigel who then spot Di Napoli, their favourite action film star. Trevor, at their request, then chases Di Napoli through the city until he crashes having driven through the Pillbox Hill Medical Center. Trevor kidnaps Di Napoli and drives the three to an abandoned garage in Strawberry for a "private interview". A few days later, with Di Napoli refusing to eat, Mrs. Thornhill and Nigel call Trevor to take care of Di Napoli fearing he will starve. The trio discuss whether to let him go in the countryside, allowing for a quick getaway before he could alert the authorities or whether to kill him. Mrs. Thornhill and Nigel, who are not good at saying goodbye, leave the task to Trevor who can either allow Di Napoli to escape or kill him by driving Nigel's car by leaving it on the train tracks before it is destroyed in a crash. Nigel and Mrs. Thornhill are not arrested and presumably continue to stalk celebrities. This page was last modified on 29 December 2013, at 18:27.